In 2013, Plain Joe Studios subcontracted my services to produce some character designs and illustrations for the Go Kids children’s ministry of River Valley Church. Since then, I’ve been doing illustrations and children’s books for the Go Kids program using these characters. Recently, Justyn Smith, co-author of the Go Kids series of children’s books, shared images on Instagram of costumed characters and products based on my character designs and illustrations. I asked his permission to share those images and he graciously gave his consent. 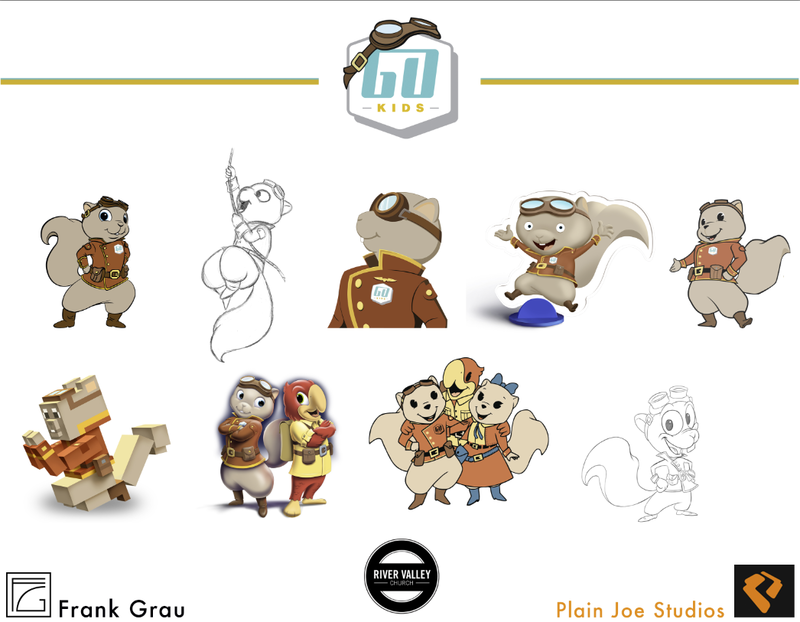 The image of Tom E. Squirrel on the left is a large poster I created for Go Kids. The watch and pins on the right are products based on the illustration. The cookies on the right also utilized my illustrations, like the image on the left. Go Kids t-shirt and mug. Justyn Smith with Robbie the parrot. Tom E. Squirrel in the flesh… or, in the fur. When I showed my wife these pics, she immediately asked if we could get some of the items, so I wrote to Justyn and he generously offered to send me some stuff gratis. What a guy!